I blogged a couple of days ago about having a hell of a lot of writing to do this weekend to succeed at the task I’d set myself of joining many others attempting to write 50000 words of a novel in 30 days. Well I did it, and it feels so good. Here is my progress chart day by day. As you can see there were rather a lot of days where I didn’t write anything, and I didn’t feel well on a number of those days (or was travelling round Italy in the rain!). But to be honest this is how I work, I have never really been a plodder, routinely working on something until it is finished. I have always been a last minute wonder, needing that adrenaline to keep me moving. Doing this for sponsorship and having people put their money towards a cause I believe in has been a good motivator and when I have actually sat down to write it has been a joy. Although, on more than one occasion I found myself eyes drooping, nearly nodding off at the computer (hopefully that is more to do with how tired I was rather than my story). But I did plod a little more than usual and sat down to write when sometimes I din’t want to, I even did a bit of planning and outlining before I started. Now, I know some of my facebook and twitter friends are still working and I wish them all the luck and determination in the world to keep going. One thing I know is that this is only the beginning and that despite the ‘Novelist’ badge that I have been wearing from the No Plot No Problem Novel Writing Kit I do not have finished novel under my belt. So I need to keep going and finish the manuscript and then go back and cut out lots of the rubbish words and add some better, more magnificent ones, and correct the name changes and that dreadful tense change, and develop my characters and fill in the plot holes and foreshadow and… I think you get the point. 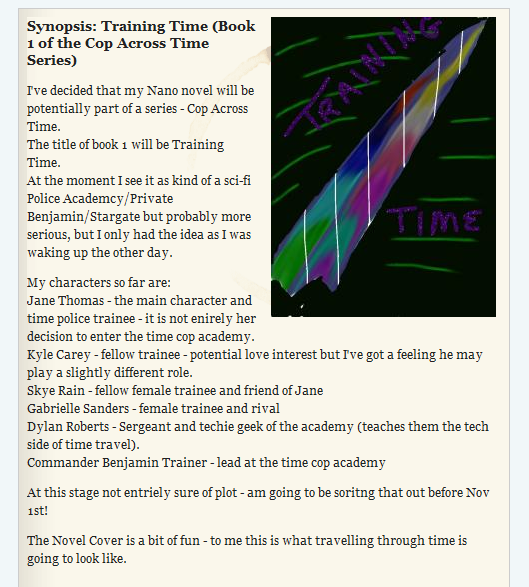 Please keep nagging me and you never know you may be in position to get a (self-published – I’m not foolish enough to think I’ll be snapped up by an agent or publisher) copy of Training Time (Book 1 of Cop Across Time) in your stocking from Santa next Christmas. Now excuse my blatant adding of NaNo Winner’s badges (which one is your favourite). I did say blatant – sorry! Good night and good nano one and all. 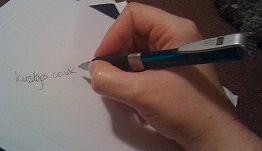 I’ve not been on here much because I’ve been embarrassed about my non progress in NaNoWriMo. As of the end of today my Word Count is 31010. [Validated through the site at 31027! ]So I’ve got 18990 words to write this weekend (I need to finish ideally by Sunday night because otherwise work get in the way). Splitting this makes the task 9495 words each day. 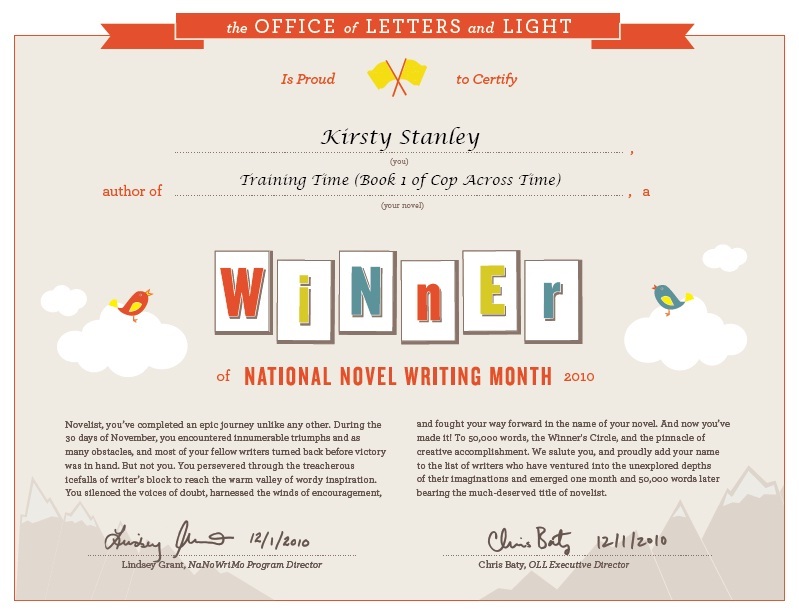 I kind of already feel like a winner because I’ve already written about 10 times more than on my previous attempts (I’ve been signed up since 2004) and more on one thing than ever before (and this has been while on holiday, at work, while ill etc). But I am doing this for charity, I do have sponsors who have paid up so I will succeed, I need to. Please send me your good luck and non procrastinating vibes (the kitchen is cleaner today than it has been in a while). I have noted some glaring errors while I was combining all my files into one for validation, mainly an immediate tense change – but do you know what I’m not going to do anything about that until I’ve finished. And pretty please if I do make it please consider adding to my sponsorship. And then keep nagging me from time to time to check that I haven’t just left the story in a file on my hard drive and done nothing with it. That would be a waste. Finally a huge well done to my fellow NaNoers who have crossed the finish line, validated and gone purple with winner and good luck to the rest of them still waiting to cross that elusive finish line. Just a note to whoever is spamming me on this blog – I am not going to approve your posts so you are wasting my time and your own. I will have to remove comments features if you don’t stop – please get away from your computer and do something more productive with your life instead – like maybe volunteering.